← Bajans on stolen list of secret Swiss bank accounts? The HSBC Private Bank scandal. Judging by the number of on again, off again press conferences scheduled in the last 24 hours by demoted government minister David Estwick, it wasn’t easy, but he (if you’ll pardon the expression) bit the bullet and took the pain. 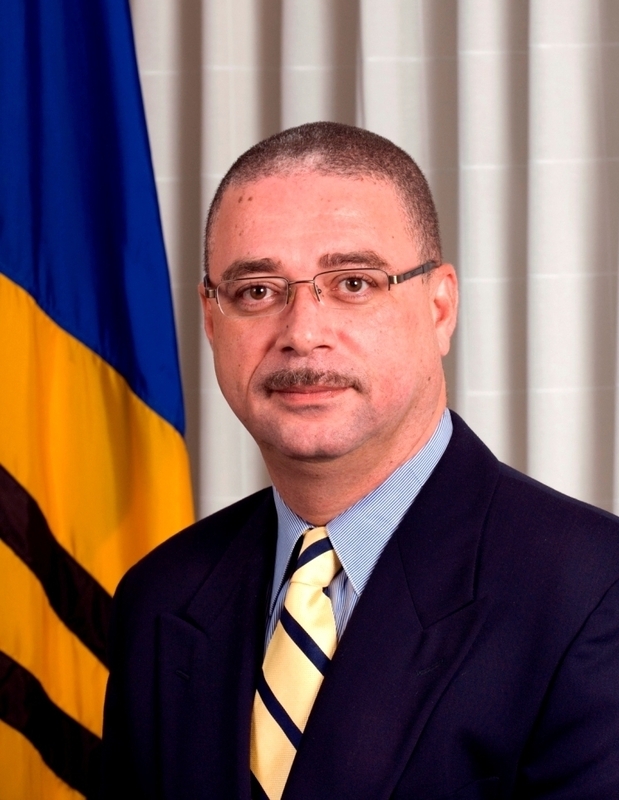 Last night Dr. Estwick issued a statement that briefly communicates his disappointment, but emphasizes his continuing commitment to Barbados, Prime Minister Thompson and his party. He wishes “all that is good” to Minister Sinckler and states that contrary to some reports he has no animosity to anyone. Estwick gives credit to his colleagues and support staff who worked with him during his time as Minister of Economic Affairs and, most important, he lists his and his team’s ongoing work and accomplishments. It is fitting that Bajans realise that no matter who has the helm, Dr. Estwick and his team contributed heavily to the foundation that has been laid for the future. We at Barbados Free Press believe that Minister Estwick conducted himself with dignity and honour under trying personal circumstances and that Barbadians of all political stripes will remember this moment in his political career with great respect. BFP carries David Estwick’s full statement in another article as we believe it is worthy of our readers’ full consideration. Our invisible Prime Minister (that’s him above) announced the latest cabinet shuffle yesterday. The fourth Cabinet in two years and eight months produced no real winners, but two big losers. That beautifully creative description comes from The Bajan Reporter article Former Economic Affairs Minister of Barbados under heavy fire. Estwick’s new position sounds about right to us, considering that we and others called for his resignation when Estwick displayed a pistol in Parliament under circumstances that can only be seen as an attempt to intimidate another member. 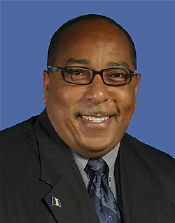 Whether Estwick was demoted for his uncontrolled mouth or the gun incident or both, he’s demoted with a public spanking. David Thompson had to do it or risk being seen as weak or not in charge. Politicians have recovered from such falls before, but it will take more than the natural healing of time for Estwick to rise again. There will have to be some fundamental behavioural changes before he can regain the confidence of the party and the public. Few Bajans will feel much sympathy for Estwick because he is the author of his own misfortune. Prime Minister David Thompson in better times. “Who will be the next Prime Minister?” is the question that no one wanted to ask aloud a few months ago, but that taboo is long gone – never no mind the reassurances given by Mr. Thompson’s voice last night. After hearing that David Sinckler is now Minister of Finance there is no doubt at BFP who David Thompson feels should be his successor. The shame as we see it is that so many cabinet shuffles and personnel switches have limited the effectiveness and achievements of the DLP Government. The DLP should have been settled and productive after 2 years and 9 months in power, but with the PM’s illness and non-performance of some of his Ministers it’s almost like the election was yesterday and we’re again waiting to see what kind of government we’ll have. And we’re not even talking about their outright breaking of the campaign promises that got them elected in the first place. Foundational promises like Integrity legislation, Freedom of Information, 2/3 Parliamentary approval for major land use changes, Ministerial code of conduct and so much, much more. Captain to the bridge! Calling the Captain! … Captain? Hello? The bridge crew can handle things for a while, but without a person in a clear position of authority the good ship Barbados is starting to wander in the rough weather ahead. “I continue to empathize with Mr. Thompson as he battles against his illness. I understand that his health has forced him to shed some of his ministerial responsibilities, and that his focus must now be on his health and getting better. It is unfortunate that the opportunity was lost to bring new energy and talent into the Cabinet. It was particularly noticeable during Mr. Thompson’s absence from office that his Ministers were not able to step up to the plate and were not equal to the task of dealing with the many issues facing the country. BFP, as predicted quite sometime ago, has become “irrelevant” a source for nothing more that irrelevant conclusions. The lack of moderate, honest, and fair dialog has rendered you intellectually void. It was you, who campaigned, substantiated and anointed this lame administration to office. Yet, merely months after its accession, you conveniently sought to discredit it………….You have sought absolute freedom of expression, while creatively subjecting that of your bloggers. Your malicious and deleterious behavior must first change, if you are ever to be considered a viable conduit for open dialog and constructive exchanges……….I will therefore donate $100.00 to any local charity at your direction, should you publish my written in its entirety……. Thanks for contributing to the blog and to a local charity. Here’s what we want you to do with the $100: Give it to the good folks at the Hope Sanctuary. Please let us know when you have done so. You’re correct that only a few months after the DLP Government took power we identified that the Bajan public had been lied to by the DLP during the campaign. We predicted that they would not implement the integrity legislation promise that pushed them over the top to win the January 2008 election. We then followed through with our promise given during the election campaign in 2007 that if the DLP were lying to Barbadians we would hold them accountable and we have done so. The fact that you think the answer is a return to the crooks of your BLP is irrelevant. It is time for real change. It’s time to punish the political elites. It’s time to vote independent. I’ve said it before and I will continue to say it: Next time around many Bajans would vote for a dead cat before they’d support either of the two old tired parties of the elites. There is no real choice between BLP and DLP. 2) “None of the above” as a choice on the constituency ballot. While there are problems that arise from not having a conclusive election, at least the people will have the opportunity to democratically voice their displeasure. Richie wasted nuff money tryin to give wunnuh a third choice. Richie shoulda keep his money and laugh at wunnuh. You get the two-party state you deserve. Six of one = half doz. of the other.